Alyssabeths Vintage: Time is Flying! Ok seriously, didn’t we just finish putting up the decorations for Christmas?? I totally forgot to decorate for Valentines and now… Easter! I’m not all to blame though, I can’t get my husband up in the attic to pull the boxes down, there I feel better knowing that it’s not all… my fault! At least I didn’t forget my step-son’s 14th birthday yesterday, Happy Birthday Connor, I did manage bake his favorite birthday cake and cook the requested chicken enchiladas for dinner. Ever since I began selling on Etsy I cannot seem to get organized or to find time to do anything. Last year I totally forgot to plant flowers both in Spring and Fall, very unlike me. I love my Etsy store , for the most part, granted I wish I was selling more, but the creative outlet and the people that I have met has been priceless. So, all that said I actually remembered that Mother’s Day is coming up soon! 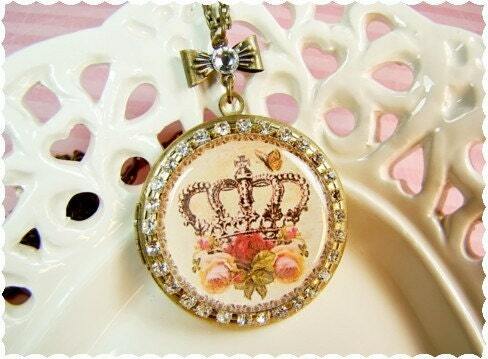 Paris Chic Rhinestone Locket Necklace Necklace with antique Paris glamour locket adorned with a collage resin cabochon featuring a French royal crown, roses and a tiny butterfly set on a repurposed brass 32mm locket and surrounded by beautiful clear rhinestones. Locket is suspended from a sweet little brass bow that is also adorned with a clear rhinestone. This is a one of a kind statement necklace! 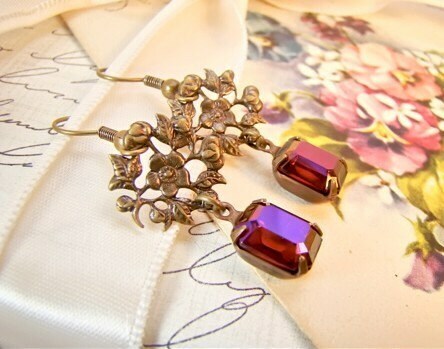 Romantic Victorian Wreath and Rhinestone Earrings Timeless style, handcrafted Vintage Inspired earrings created with ornate & delicate floral wreath antiqued brass stampings, vintage iridescent glass jewel rhinestones with lovely with velvety shades of Purple, Red and Fuchsia. 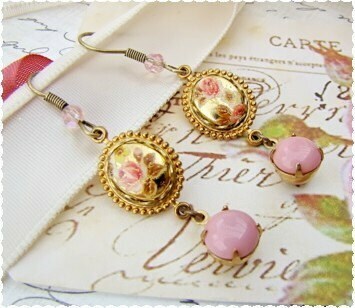 Each sweet earring is hung from antiqued brass French ear wires. 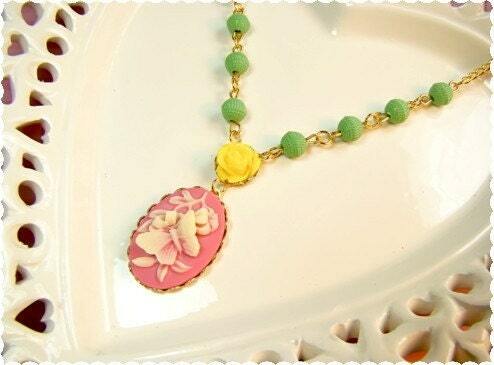 Raspberry PinkButterfly Cameo Necklace Adorable necklace handcrafted in bright pastel Easter Egg colors! The necklace features an oval raspberry pink and cream butterfly cameo, which is suspended form a bright buttercup yellow rose cabochon, a hand wire wrapped vintage mint green Lucite beads and shiny golden brass chain.